Steak Caesar Salad, Thyme for Cooking gourmet summer main course salad. Of course this isn't a traditional Caesar Salad - or even the popular Chicken Caesar...... But the tastes are similar and it's an easy summer salad. Mix chili powder, Worcestershire, oil and garlic. Slice steak on the diagonal, across the grain into strips. Clean the mushrooms and cut in half. Add mushrooms and steak to chili powder mixture and toss to coat. Cook on barbecue grill in a pan or sauté in a nonstick skillet over medium high heat (with a bit of olive oil) on the cook top. Either way cooking time is 3 - 4 minutes. Slice tomato, then cut slices in half. Put lettuce in large salad bowl tearing if necessary. Toss with some of the dressing. 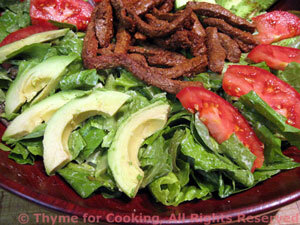 Arrange steak, mushrooms, tomato and avocado on top. Put mustard, lemon juice and yogurt in small bowl and whisk well to combine. Slowly add olive oil whisking constantly. Add garlic, herbs and Parmesan. Dressing should be thick. This will keep a week in the fridge.